I have to admit I am on a major Fruit Loops kick. When I was in training in Napa Valley a couple of weeks ago, for breakfast they had boxes of cereal out and I saw Fruit Loops. I haven’t had them in years. I knew I would be hungry mid morning, so I took a box for my snack. I like to eat them plain with no milk. Well the craving came on more and more and every morning I would steal a few boxes of Fruit Loops. 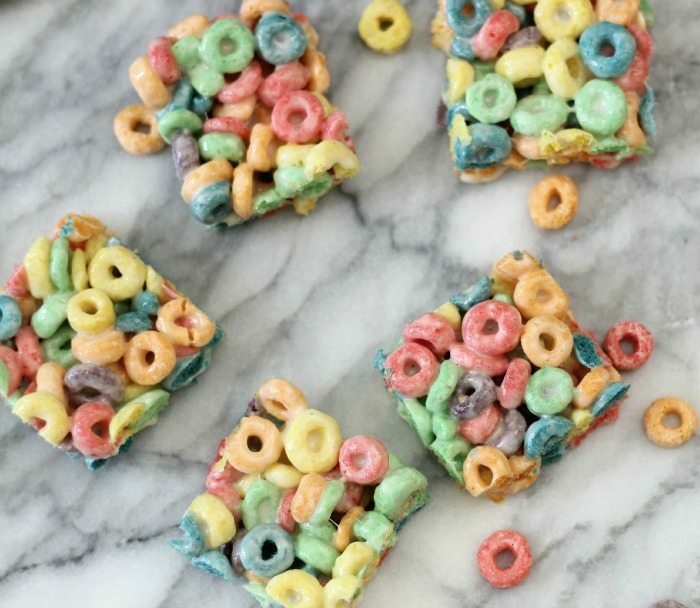 With my new-found craving I thought I would make Fruit Loops treats today. These treats are sweet, fruity and perfect for making with kids. Plus it’s a fast treat to make. 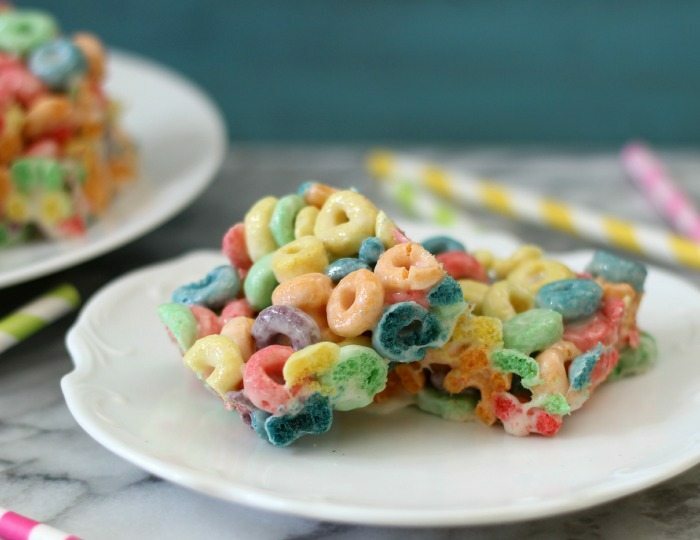 It’s made with marshmallow, butter and Fruit Loops Cereal. 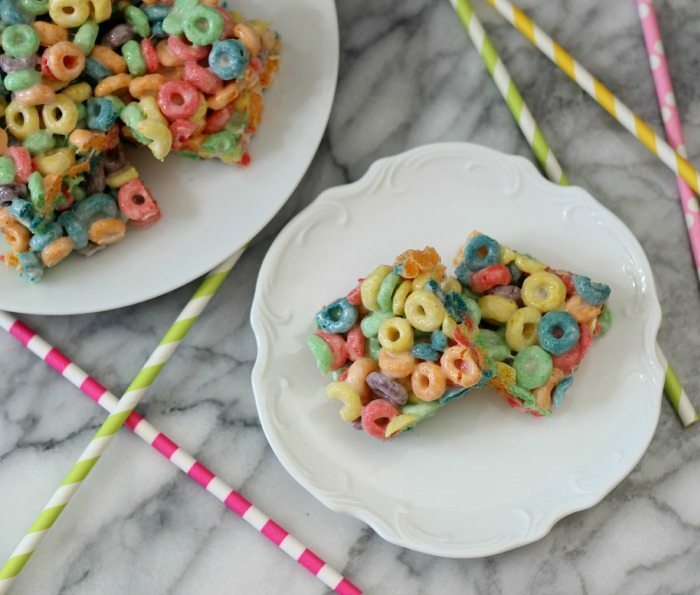 It’s the same basic recipe as Rice Krispie treats but made with Fruit Loops instead. The recipe makes 24 bars and are only 77 calories each. I don’t think that is to bad for a sugary treat. To make; I just melted butter and marshmallows together, stir in the cereal and put in an 9 x 13 baking pan. How easy is that? It took me less than 10 minutes to make the recipe. The hardest part was waiting for them to harden up so I can cut them up and eat them. My bars are about 1 1/2″ in height, but if you like thick bars, you can add them to a 9 x 9 brownie pan. I like the shorter version, more to have for lunches. 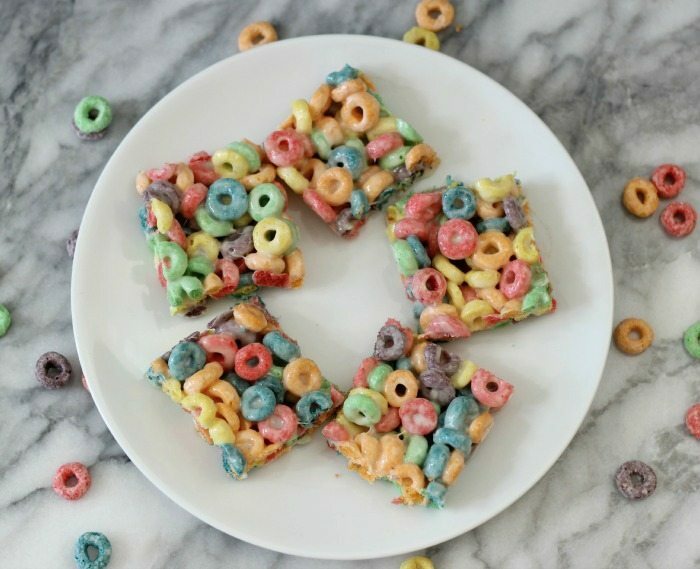 A sweet, crunchy, fruity bar made with Fruit Loops cereal and marshmallow. Spray a 9 x 13 baking pan with cooking spray; set a side. In a large pot, over medium low heat add butter and melt. Once butter is melted add marshmallows and stir constantly until melted. 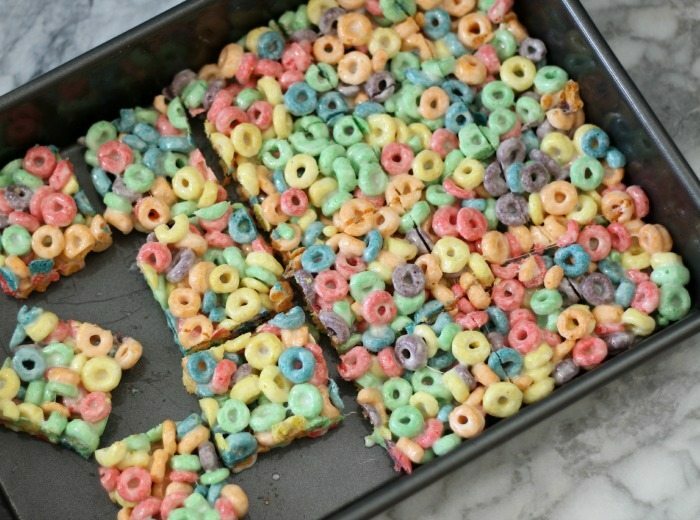 Take off heat and quickly stir in the Fruit Loops cereal. Pour cereal mixture into prepared pan and smooth out with a spatula sprayed with cooking spray. You can also spray your hands with cooking spray and push cereal down into pan. I know this is a simple, random recipe, but it’s a perfect childhood treat. I was excited to make them and even more excited to eat them. you spelled froot loops wrong. Really – does it matter? It was a great recipe and you feel the need to criticise spelling of fruit / froot! Why not say thank you instead as you may be happier sharing kindness instead of criticism!!! To the person who shared this – thank you!! It was such an easy recipe to make for a last minute cake sale. I AGREE!! WHY PICK ON SOMETHING THAT DOES NOT MATTER? Really? Sad world. Understand if you did it to actually help and stated something kind but you did it because thats the type of person you are! Ive made these before and YUMMO! Going to use trix next time and the apple jacks. Have you used golden grahams and semi sweet chocolate morsels to make SMORES? You make them the same way as yours, when mixing to place in bowl while not as hot stir in chocolate so it doesnt melt. THEY ARE SOOOO GOOD. Looky there I spelled so wrong. Have a fantastic day! My daughter and I just finished making these with the new Unicorn loops for her Girl Scout meeting tomorrow. They are cute and will be fun for 8 1st graders. A nice easy recipe for a weeknight! Thanks! You’re welcome! One of my favorite cereals too!